Terrible night’s sleep last night which I’m thinking must have been due to the late run I did (finished 10m). As I’ve got the race on Sunday and I’m supposed to be resting I’ve not done much on the exercise front today. I did, however, walk to the shop and back and, having measured this on walkjogrun.net, I’ve found that the distance totalled 2.13 miles – that’ll do for today! Tomorrow I’ve got a nice and easy 4 miler. Although I’m thinking about upping that to 6 miles… I’ll see. 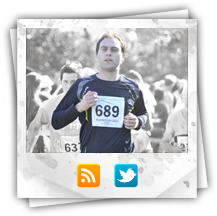 This entry was posted on Monday, June 6th, 2011 at 8:02 pm	and is filed under Juneathon 2011. You can follow any responses to this entry through the RSS 2.0 feed. You can leave a response, or trackback from your own site.